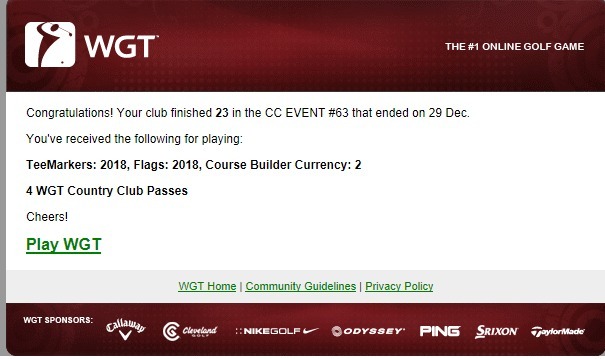 Start the party early as we ring in 2018 with CC Event #63. Compete now through Fri, 12/29 for your chance to win in-game rewards, including these 2018 tee markers and flags. 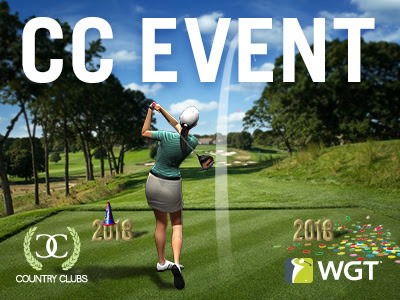 CC Event #63 runs 12/28-12/29 with multiple 4-hour Clashes, so be sure to play as many games as you can for your club and keep your eyes on the leaderboard. CLASH # 63 MAY be starting at midnight tonight . If you are a participant and you receive a 5 pack of passes with the title Passes for CLASHES . Please use them . You received them because you signed in to the event and to enable you to play 5 more rounds . We start with 20 SP's . We gain 2 more at the beginning of each CLASH after the first CLASH . If we play 10 more CLASHes . That = 20 + 20 = 40 . That is equivalent to 5.7 passes each for our 7 officers . If we each plan on using 6 each . It will work out . We here at VOTSCC enjoyed our CLASH with your CC in CLASH # 63.